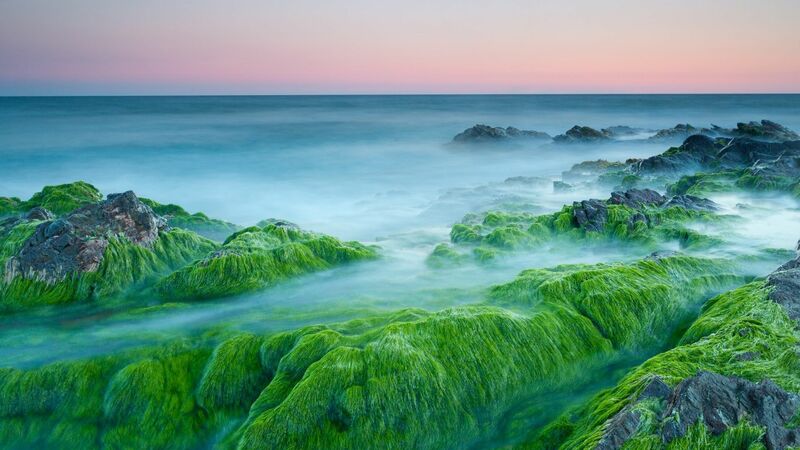 The use of algae is very old and is mentioned in the Chinese poetic literature about 600 B.C. The phycologists are continuously working to get hold of their economic importance and have unearthed many beneficial as well as harmful economic aspects of algae. Because of their photosynthetic abilities the algae are the primary producers of the aquatic environments. They provide food and energy to the animal life, produce oxygen and take up carbon dioxide produced during respiration which is injurious for living organisms especially fishes. More than 100 species belonging to green-, brown- and red-algae are used as food for humans because of presence of proteins, carbohydrates, minerals and vitamins, either in the cell wall or in the cytoplasm. These include Monostroma, Ulva, Codium and Chlorella. The highest food value is estimated in brown algae. The algae also afford as food for animals especially in coastal countries. Laminaria, Sargassium, Fucus and Ascophyllum are used as fodder for animals. Fucus is used in hen-feed as-its usage result in eggs with high iodine contents. Similarly, the algae serve as primary food for fish. Certain fishes such as Tilapia feed on algae exclusively. Agar-Agar: It is dried, jelly-like, non-nitrogenous extract obtained from some genera of Rhodophyta like Gelidium, Gracilaria, Ahnfeltia, Hypnea, Gigiartina, Phyllophora, etc. It is used as base for different culture media in laboratory for culturing microorganisms because of its food value and ability to afford good range of temperature for culturing. Alginates: These are alginic acid and their derivatives, the most common being algin. They are usually extracted from the middle lamella and primary walls of the brown- and red-algae. The alginates are used in rubber-tyre industry, paints, ice- creams and in preparation of flame-proof fabrics and plastic articles. Carrageenin: It is a carbohydrate mucilage extracted from red algae used as clearing agent in beer preparation, in preparation of tooth-pastes, cosmetics paints and in pharmaceutical industries. Iodine: The members of brown algae such as Laminaria and Fucus yield iodine. Diatomite: It is cell wall material of diatoms. The deposits of fossil frustules of diatoms are known as diatomaceous earth. It is used variously such as food for many aquatic animals, for filtration processes in sugar refining and brewing industry, for production of heat-proof bricks, in manufacture of car-polishing creams, manufacture of water-glass, and preparations of bleaching powders. Due to presence of about 11% oil (by volume) in the diatom cells it is considered that the oil supply of the world is of diatom origin. Fossilized diatom shells are valuable indicators for presence of oil and bitumen at a place. Some algae yield antibiotics, e.g., Chlorellin is obtained from green alga Chlorella, that inhibits the growth of certain bacteria. Similarly, some species of Polysiphonia produce antibacterial substances which are effective against gram-negative and gram- positive bacteria. An antibiotic is obtained from a diatom Nitzschia palea which is effective against Escherichia coli. Because of high iodine-contents, brown algae is used in manufacture of various goiter medicines. The conversion of atmospheric nitrogen into nitrogenous compounds is one of the major roles being played by the algal plants especially by the members of Cyanophyta (blue-green algae). A high rice yield has obtained when the rice fields were inoculated by certain nitrogen- fixing blue-green algae. Due to presence of phosphorus, potassium, calcium and some trace elements, the sea-weeds (brown algae) are used as fertilizers in most of the coastal countries of the world. For example, Chara is used to overcome calcium deficiency in the fields, and Fucus is used as a common manure. Kelps (brown algae) are variously used for their mineral contents in preparations of soap and glass due to presence of soda contents, for extraction of potash and iodine, and as source of ammonia and charcoal. Some sea-weeds (brown algae) are rich source of iron, zinc, copper, manganese and boron. Bromine is extracted from red alga Polysiphonia. Sewage mainly consists of domestic and industrial wastage and contains many organic and inorganic constituents in dissolved or suspended form. The effective disposal of sewage requires oxygen and this the oxygenation is brought about by the algal members, present in the sewage like Chlamydomonas, Euglena, Chlorella, etc. The oxygenation by algae also helps to avoid unpleasant odor coming out of sewage bodies. During rainy season, many members of Cyanophyta and Chlorophyta develop on the rain-affected soils and help in checking the soil erosion on disturbed or burnt soils. Therefore, these algae act as binding agents. Similarly, algae like Nostoc and Anabaena grow as thick substratum on the surface of saline user soils and help in reclamation of these soils. These plants help in reducing the pH of the alkaline soils and increasing the Water-holding capacity of these soils making these useful once again. The algae show a luxurious growth in water reservoirs meant for domestic plies. Such algae include members of Cyanophyta like Nostoc, Anabaena, Mcrocystis and Oscillatoria; members of Chlorophyta such as Chlamydomonas and Volvox; and some diatoms. Their abundant growth interferes the filtration process and also brings bad taste to water due to decay of dead algal plants. Sometimes algal plants show profuse growth and form quite apparent bodies called water blooms. Usually the members of Cyanophyta form water blooms in fresh-waters and members of Dinoflagellatae in marine waters. These bodies emit bad smell, secrete certain poisonous substances harmful to aquatic animals, and also sometimes checks the speed of ships due to their presence in the form of a thick layer. The water blooms sometimes also deplete the oxygen contents of the water during night time as these act as barriers between the water and outer atmosphere so that the atmospheric oxygen cannot come in contact with the water and get dissolved in it. The decaying dead algal plants secrete certain poisonous by-products which are injurious to the life of the aquatic animals. Also, some algae, e. g., Microcystis aeruginosa and M. toxica secrete toxins which cause the death of the aquatic animals including the fish Ingestion of some of dinoflagellates like Gymnodinium, Gonyaulax and Pyrodinium cause death of a large number of fish. The water in which these species are growing also becomes poisonous and results in the death of cattle’s by drinking this infected water. The water contaminated by Microcystis and Anabaena causes stomach troubles in human beings. Similarly, respiratory disorders have been observed when the water infected by Gymnodinium brevis is taken by the humans. Lyngbya and Chlorella are responsible for skin diseases and some other algae cause allergies. Some algae are parasites on other plants and animals as well. Most of these belong to the Rhodophyta (red algae) and include genera like Pterocladiophila hcmisphaerica which is parasite on Pterolcladia lucida, and Gelidiocolax mammilata parasitizing Pterocladia, etc.